If you have unpaid debt, the last thing you want are those dreaded calls from debt collection agencies. With that being said, the one thing you do not want to do is ignore them. It can really make the situation worse. The key is to try and settle with the original creditor to work out a payment arrangement before it is sold to a 3rd party collector. If your debt has already fallen into the hands of a 3rd party, below are 10 tips to help you deal with debt collectors. 1. Know your rights. When it comes to debt collectors, they must follow certain rules. They may not harass you by threatening violence or arrest. They also may not use profane language or be misleading about who they are. These are just a few of the rules they must abide by. For a full list, check out the Fair Debt Collection Practices Act. If you do experience any harassing behavior from a debt collector, you should report them to the U.S. Consumer Financial Protection Bureau as well as your state attorney general. 2. Don't ignore the phone calls and letters. You have 30 days to send in a written request for verification of any debt that is trying to be collected. After that, the situation becomes less beneficial for the consumer. This is especially important to do if the debt does not belong to you. If you end up ignoring the phone calls, debt collectors can report this negative information to the credit reporting agencies where it will remain on your credit report for seven years. And we all know what this can do to your credit and your ability to attain a mortgage or any other loans. 3. Hire a consumer lawyer. If you find yourself with a lawsuit against you, enlist a consumer law attorney to represent you in court. You can go onto the National Association of Consumer Advocates website to find one in your area. If you wind up in court and end up losing, your wages could be garnished. The most important thing to remember here is to take this seriously and show up for any hearings with representation. This could increase your chances of having the lawsuit dismissed. 4. Be sure to keep all copies and notes on everything. When it comes to important documents, it is better to be safe than sorry. Any important documents should be kept for the long term and probably never thrown out. Especially those dealing with resolution of debt. There have been cases where someone has been contacted years after a debt has been settled only to be told it has not. You want that proof. 5. Safeguard bank accounts. Debt collectors have the ability to freeze your checking and savings accounts for nonpayment of debts. As you can imagine, this is a huge problem that can really turn ones life upside down. If you are an older person, experts advise on keeping separate bank accounts for funds such as disability checks and Social Security. These happen to be exempt from any court-ordered debt payments. Be sure to tell any debt collectors if your account only has these exempt funds. Furthermore, if you have filed for bankruptcy, let them know that too. Debt collection is put on hold if that is the case. 6. Do not pay with personal checks. Many experts say that you should not give any of your bank account information to debt collectors. If you are going to make a payment, do so with a third-party payment service or with a money order. This will provide you with proof of payment. You also never want to allow a debt collector to make a direct electronic withdrawal from any of your bank accounts. 7. Record conversations. Debt collectors can be rough so it is a good idea to record any conversations you have with them. If they threaten you or use abusive language, you have it recorded. There are about 12 states where recording a conversation is prohibited , so be sure to check if yours is on the list. It is also a good idea to get their permission to record the conversation. By doing so, they are more likely to stay in line if they know they are being recorded. 8. Get everything in writing. If you make any arrangements for payment, this should be confirmed in writing by a representative of the debt collector. Be sure this is taken care of prior to sending any payments. This will help avoid any miscommunication about the amount you are paying as well as the time frame in which you agree to make payments. 9. Send any correspondence by certified mail. We have all had mail get lost. Any mail with debt collectors should be sent via certified mail. You should even go as far as to request a return receipt as proof that your mail was delivered and received. 10. Negotiate. 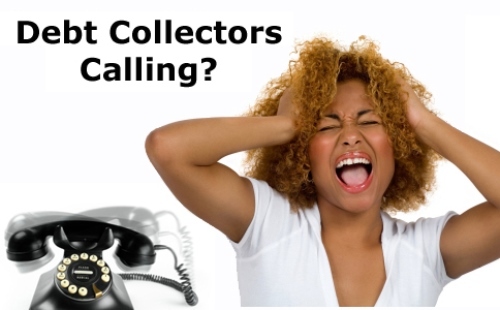 When debt collectors are calling you, they are looking to get whatever money they can from you. Chances are they will be willing to work out some sort of deal where you will end up paying less than you owe. Offering 10%-15% below what you owe is a good starting point. They will most likely end up settling for 30%-50%. Before you make any payments, make sure you get the deal in writing and only pay with a cashier's check. A second negotiation strategy you could try is to offer to pay the debt in full if they agree to contact the credit bureaus directly and have the collection account removed. This one may be more tough to get accomplished, but it's worth a try and of course get it in writing.